Each of the major Hindu deities is associated with a vahana; a bird or animal on which he or she rides. 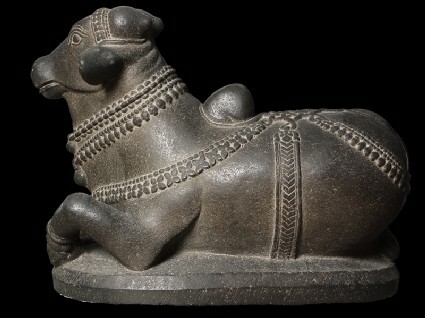 This sculpture is of Nandi the bull, vahana of the powerful god Shiva. Worshippers arriving at a temple dedicated to Shiva will often encounter a large sculpture, like this one, of the reclining bull gazing devotedly towards the inner shrine, where the image of his master Shiva resides. Sculpted in hard basalt stone, this image shows Nandi as a young Indian humped bull, ceremonially decorated with chains, bells and ornaments. The bull reclines with one foreleg tucked aside and the other half-raised, and he licks his nostril with his tongue. This sculpture has the typically sweet and beguiling expression of Indian bovines, which has made them a favourite animal subject for Indian sculptors and painters over the centuries. Shiva’s association with a bull dates from very early times. The significance of the bull as a symbol of fertility and strength was widespread in India as early as the Indus Valley Civilization (about 2000 BC), as well as in ancient Egypt, Greece and the Near East. Presented by Robert Sewell, 1899. The humped bull (bos indicus) has always been a favourite with Indian artists, going back to the engravers of the Indus Valley seals. After the Gupta period, Nandī, the bull, becomes intimately associated with Śiva as his “vehicle”. This is the rather unfortunate translation of the Sanskrit word vāhana denoting the animal or bird which is particular to a divinity and on which he or she sits or rides. Viṣṇu’s vāhana is Gāruḍa, an anthropomorphized bird [see EA1965.161], and that of Brahmā, the goose (haṃsa) [see EA1969.43]. It is, however, as a large sculpture in the round of a young couchant bull, usually placed facing Śiva temple, that Nandī is best known. Nearly every one of the thousands of temples has its Nandī and there is a gigantic example outside the city of Mysore. He is invariably portrayed, whatever the size of the sculpture, as a young bull, his horns mere stumps, caparisoned with bands, chains or garlands and hung with bells. His pose varies little and, however conventionalized the style of the carving, there rarely fails to emanate from it the deep sympathy, based on close observations, which the Indian sculpture of every age never fails to show for animals. Here, the tongue licking the nostril is a small but compelling touch.